Pilgrims are credited with observing the first Thanksgiving in the United States as a way to celebrate their first harvest in the New World, a celebration of giving thanks for prosperity. Just as the first Thanksgiving was celebrated with an abundance of food, most Americans today observe Thanksgiving with tables filled with roasted turkeys, vegetables, and an assortment of pies and cakes. A table filled with fruits of our prosperity. A Thanksgiving tablescape that echoes prosperity is one filled with gold and white settings and decorations. This table is set with reminders of the abundance in our lives on a holiday set aside to give thanks and praise for this year's harvest. Gold and white place settings surround the gold and white adorned Cinderella pumpkin that is a Fall fruit symbolic of harvest time. 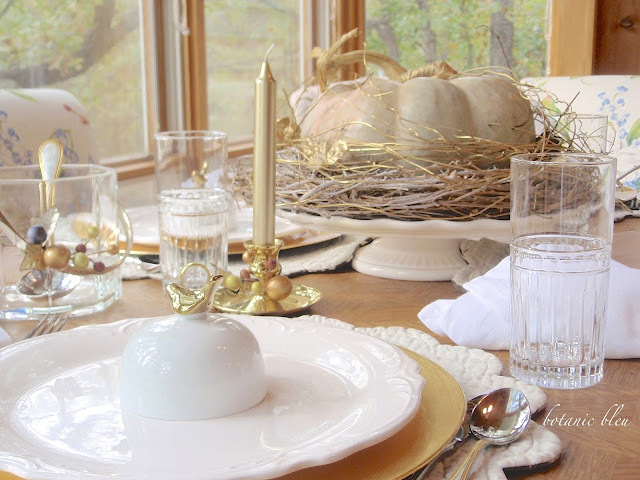 Part of the beauty of this table setting is how little it cost to create because we live in a country with stores filled with goods at reasonable prices that are within most budgets. Using existing items also helped keep the cost low. The small French table for four barely has room to hold food for regular meals and is not large enough to hold a turkey dinner with all the traditional side dishes. The kitchen island is large, and the Thanksgiving meal can be served buffet-style from it leaving room on the table for a large centerpiece. 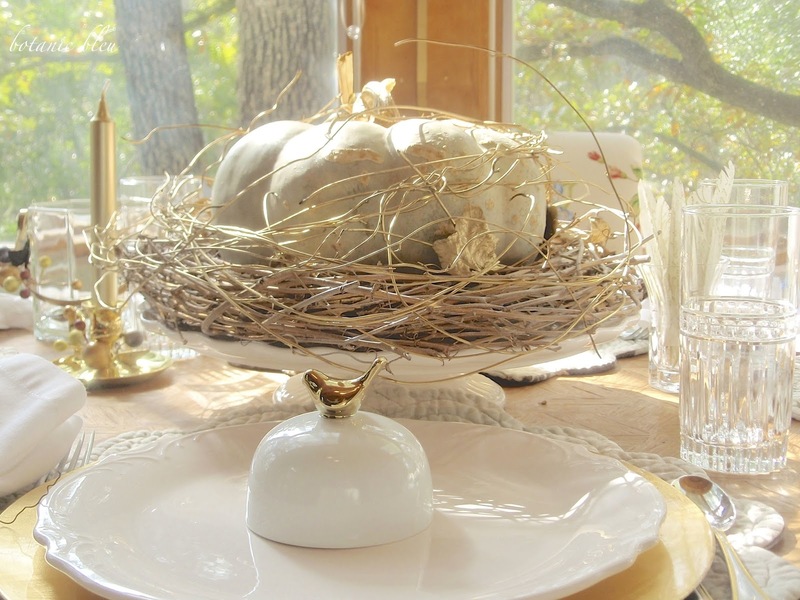 By repurposing the Fall Cinderella pumpkin, there was no need to buy anything new as a centerpiece. 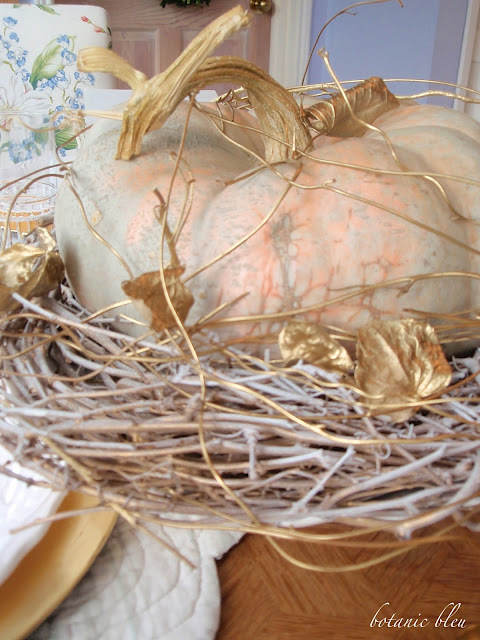 With just a little gold and white spray paint and some vines, the pumpkin was transformed. 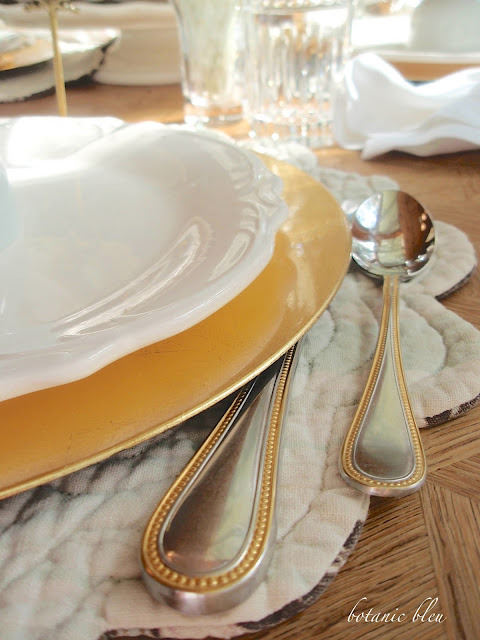 One of my favorite dishes to use for centerpieces, and best bargains ever, is the white footed stoneware cake plate that came from the local Goodwill Store. The joy from using it for the past two to three years has been worth much more the $7 it cost. The brass candleholder was a Christmas present from one of my brothers many years ago. Brass is becoming popular again. Whenever de-cluttering, always keep in mind the quality and sentimentality of items. Quality is always in style, and you can always find ways to use quality items. 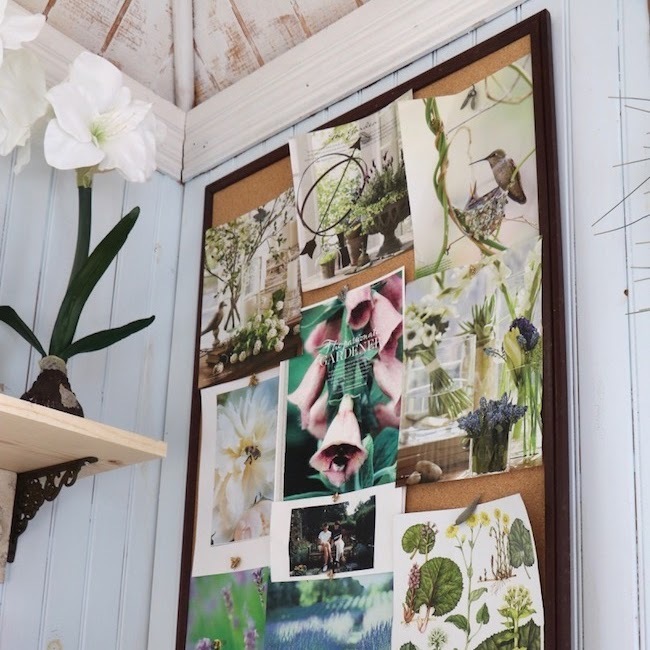 Reusing beautiful things is a good way to keep decorating budgets in control. The multi-colored beaded candle ring is a Christmas package decoration from several years ago that has Fall colors. 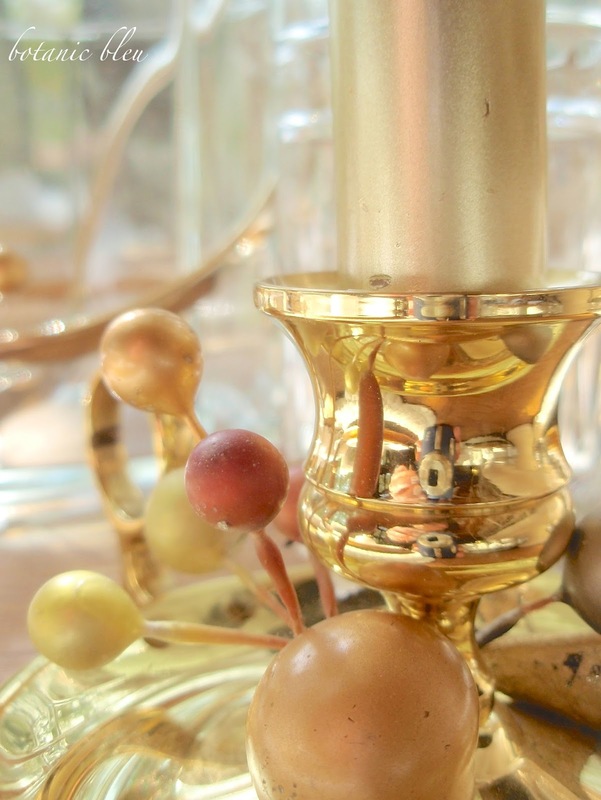 Over the years, the little decoration had been attached to many presents before circling the brass candleholder. The glass octagonal bucket's golden handle is decorated with a second beaded Christmas decoration. 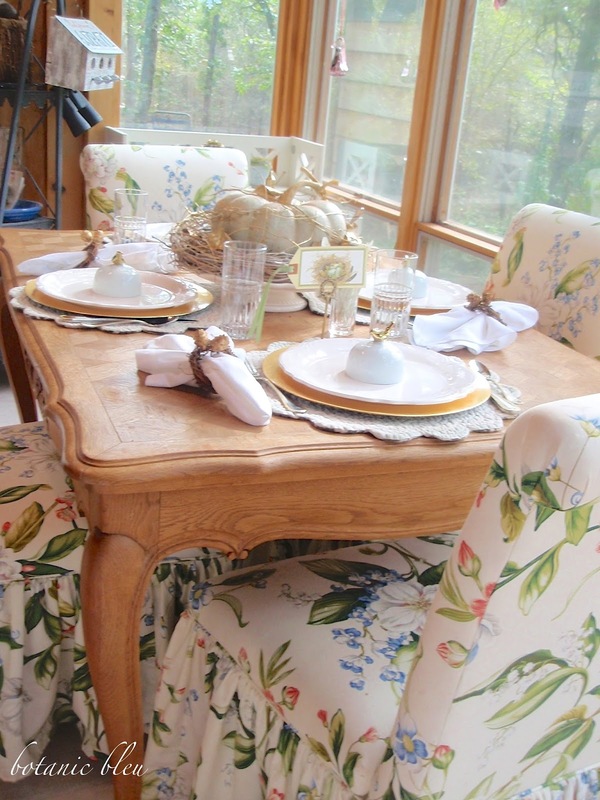 Repeating decorations in a table setting helps unify the table and keeps the overall design coherent, not disjointed. 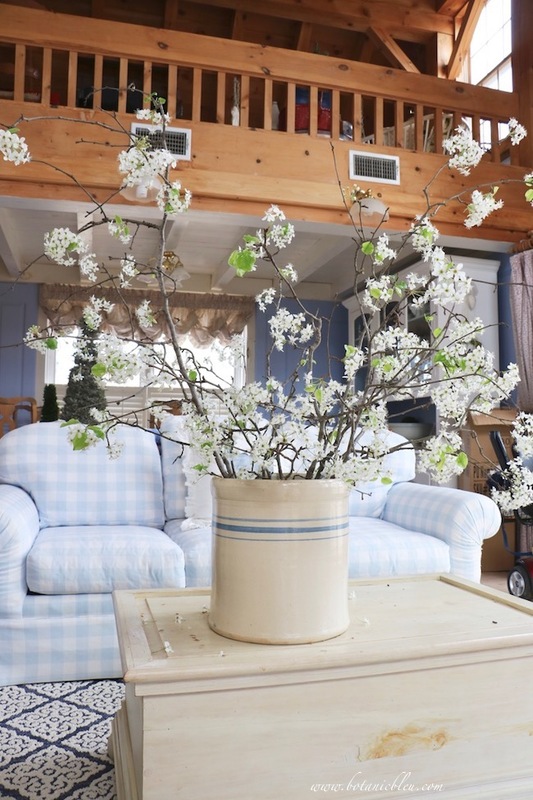 The glass bucket is an antique mall find and cost very little. While its original purpose may have been for ice, whole cranberry sauce would be beautiful served in it. 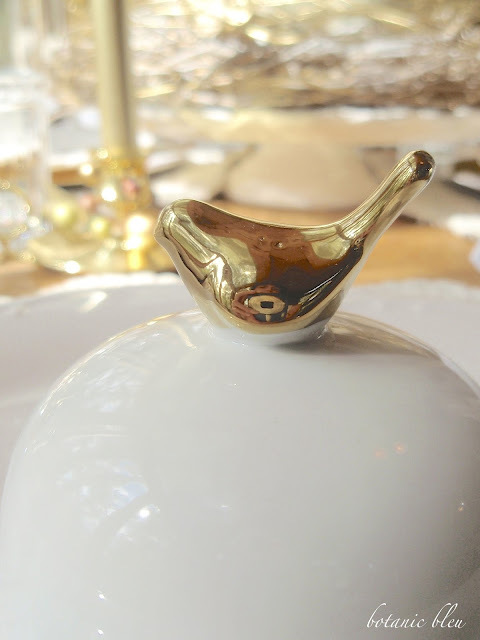 Use the gold-beaded gravy ladle to serve the cranberry sauce, or use the ladle to serve giblet gravy from the glass bucket. Brand-name outlet stores are another way to set a beautiful table for a fraction of the cost of retail prices. 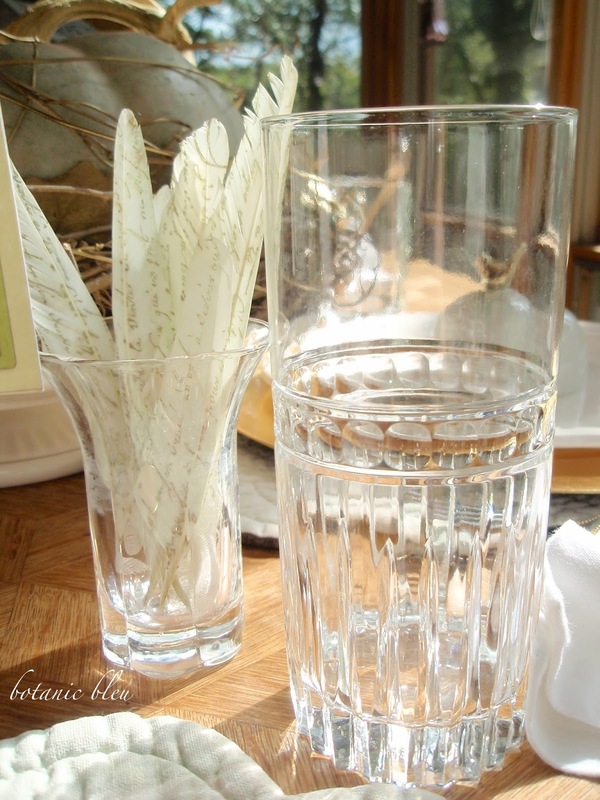 The crystal glasses were 80% off at the Memphis, TN Williams and Sonoma outlet store. These are light weight, and fit small-size hands very well. Weight and size are factors for older family members at the Thanksgiving table. Grapevine wreath napkin rings repeat the grapevine wreath decoration at the base of the centerpiece pumpkin. Hobby Lobby sells packages of six small grapevine wreaths for $2.99, but also offers them for 40%-50% off during their Christmas decoration sales. At 50% off, each wreath costs just 33¢. Use some of the gold metallic spray paint used for the vines around the pumpkin on small pinecones collected on nature walks during the year. These pinecones were collected from the ground at a Texas highway rest stop last year. The gold pinecones dress up the grapevine napkin rings, and their price, FREE, cannot be beaten. 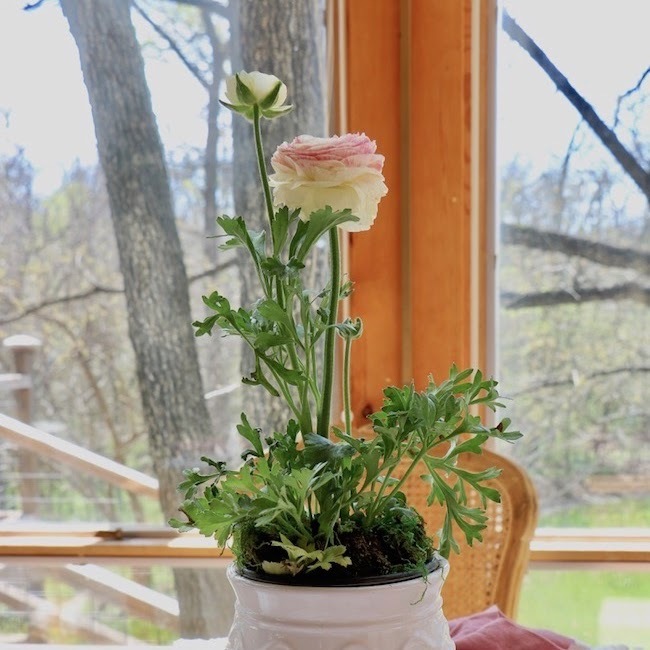 Add a little whimsy for fun. Feathers stamped with gold French script repeat the gold and white color scheme. An unusual touch, the feathers are easy to make. 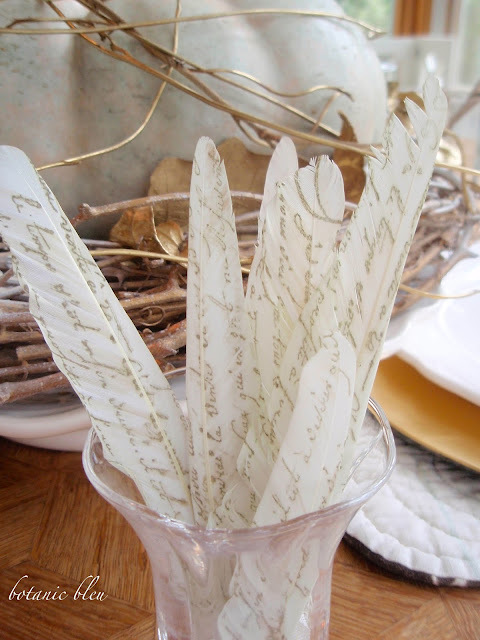 Use white feathers, and stamp them with a French script stamp using gold stamping ink. Once again, watch for 50% off rubber stamps and ink at Hobby Lobby. 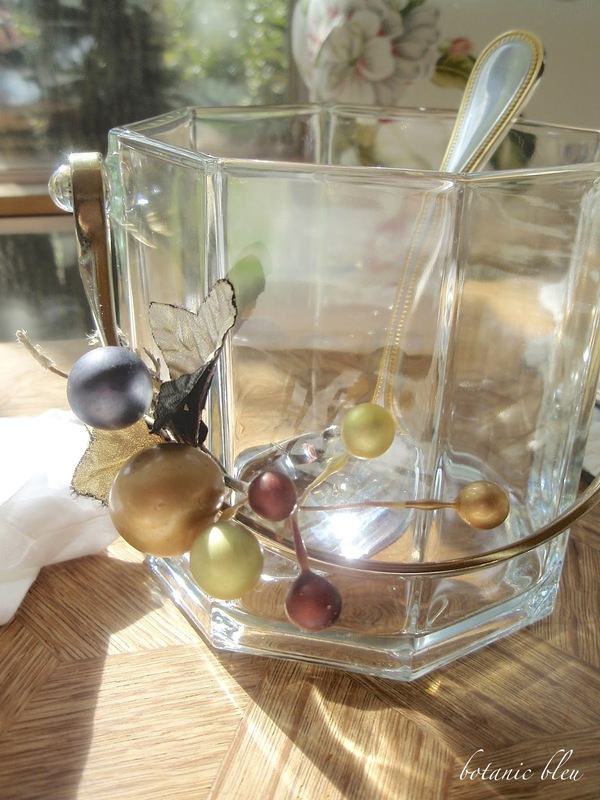 For best effect, display them in clear glass containers like this small vase or in a small used jam jar. 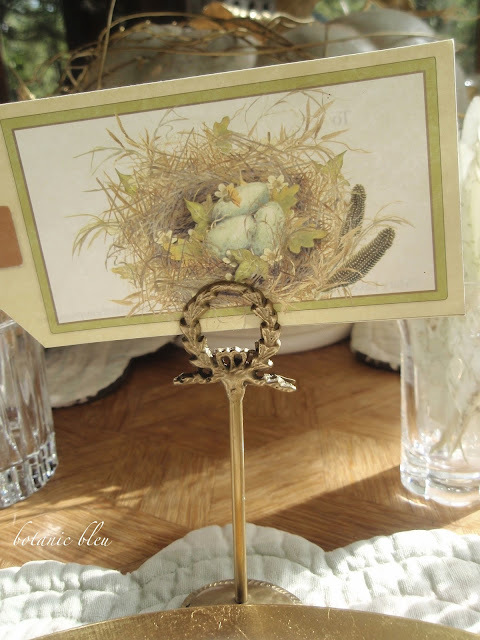 A small gold-colored place card holder with a wreath design adds another touch of France to the table. The paper card with the wild bird's nest repeats the feather look in the gold script feathers and the wild tendrils of the vines around the pumpkin. 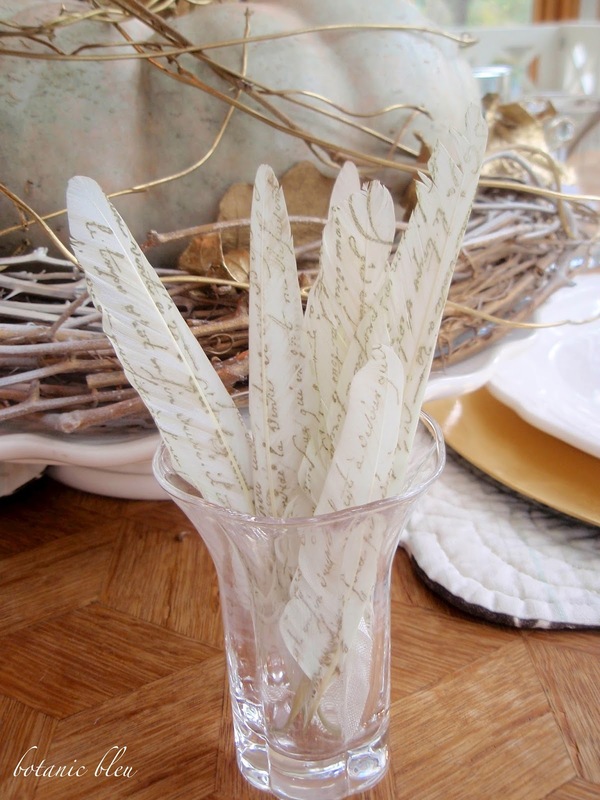 Beautiful paper cards are an inexpensive way to add seasonal touches to a table setting. Pier I offers the scalloped edged white dishes with plates priced at $6. These were bought on sale for 20% off a couple of years ago. 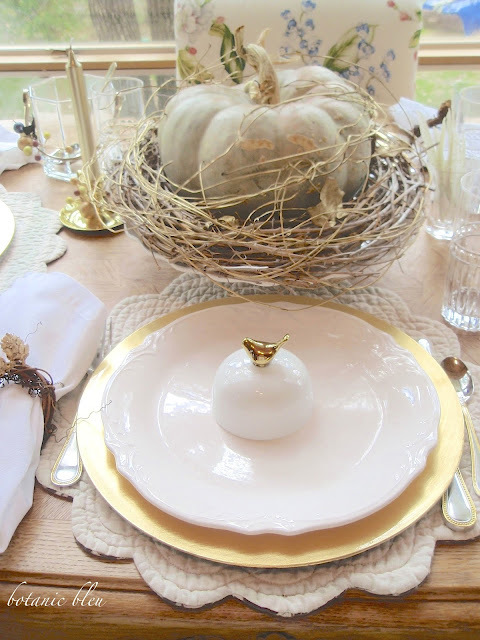 Notice the repeated design of scallops in the plates, placemats, and cake plate holding the pumpkin. Gold beads in the flatware coordinate with the inexpensive gold round chargers found at Walmart for $1.48 each this month. 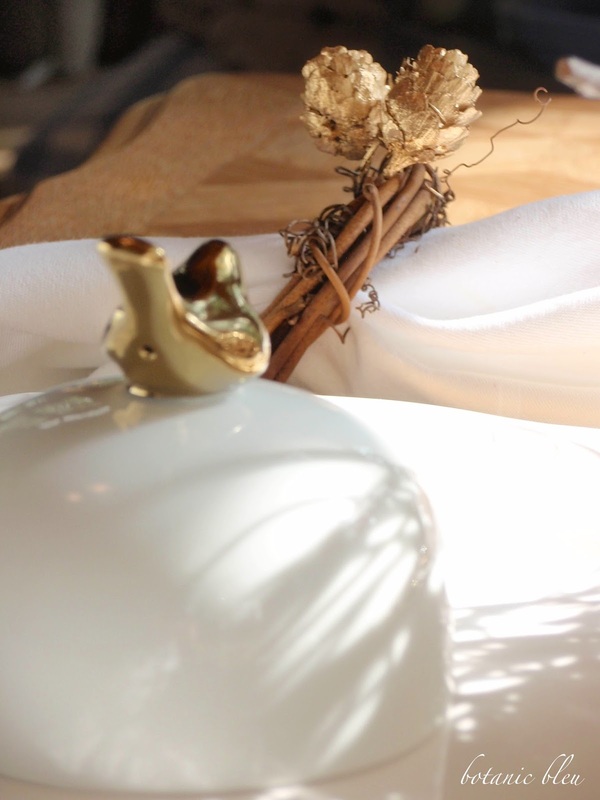 Sometimes, a special gold and white cloche captures your heart so much you spend full price. 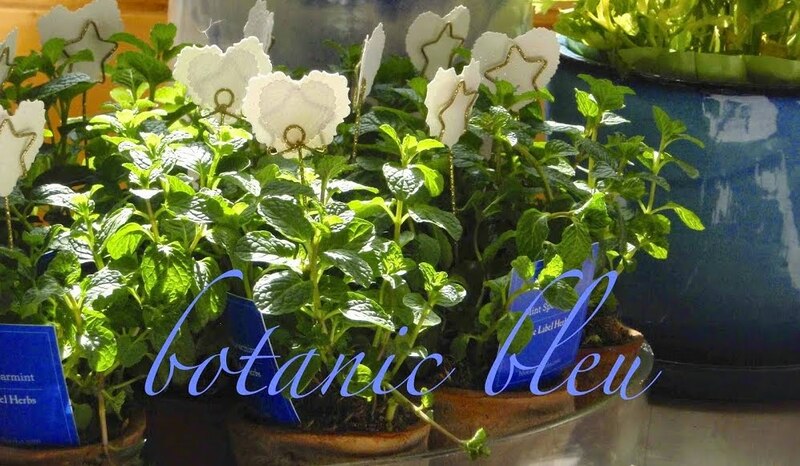 These little white cloches with the gold birds were so unusual that I could not pass them by. And, the little bird has captured me as a selfie taking his photo with my little bleu point-and-shoot Olympic camera. 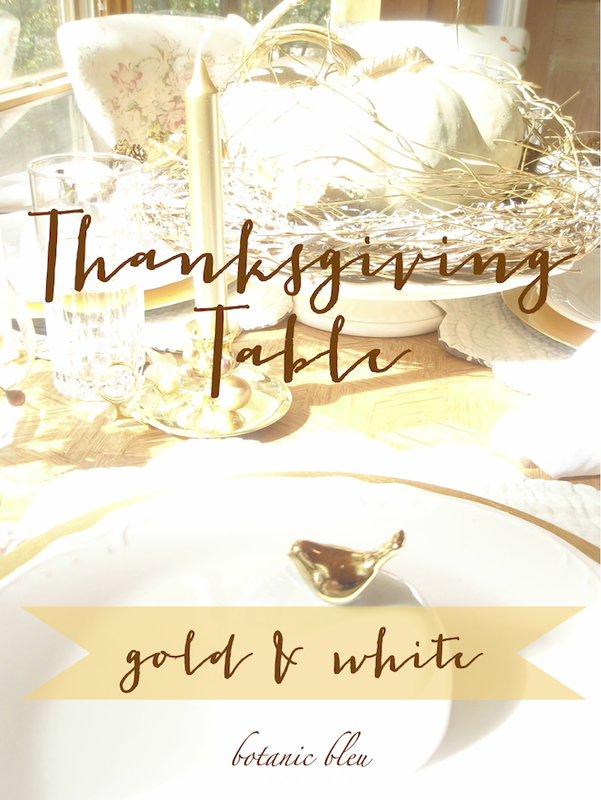 This year's harvest at my house was not in fruits, vegetables, and wild game, but in my income that allowed me to gather a gold and white Thanksgiving table. The abundance in the United States is a blessing for the vast majority of Americans. Thanksgiving is a time to reflect on all the prosperity and blessings in our lives. 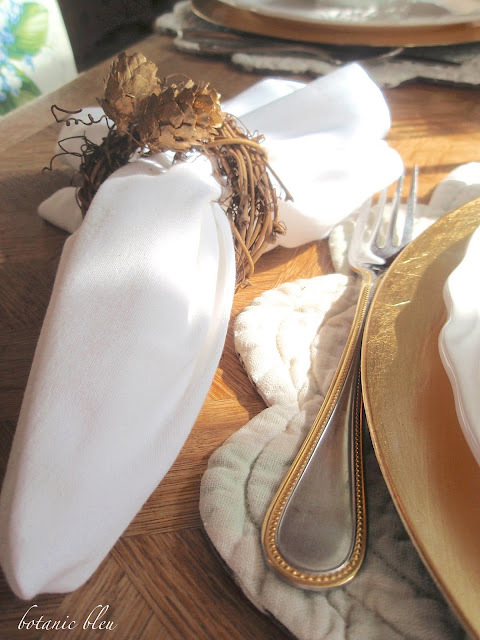 Another blessing is the luxury of being able to spend time creating beautiful table settings instead of spending all my time working to survive. Finally, another blessing is my readers. Thank you for stopping by to spend time with me. May your Thanksgiving be filled with the love of family and friends. 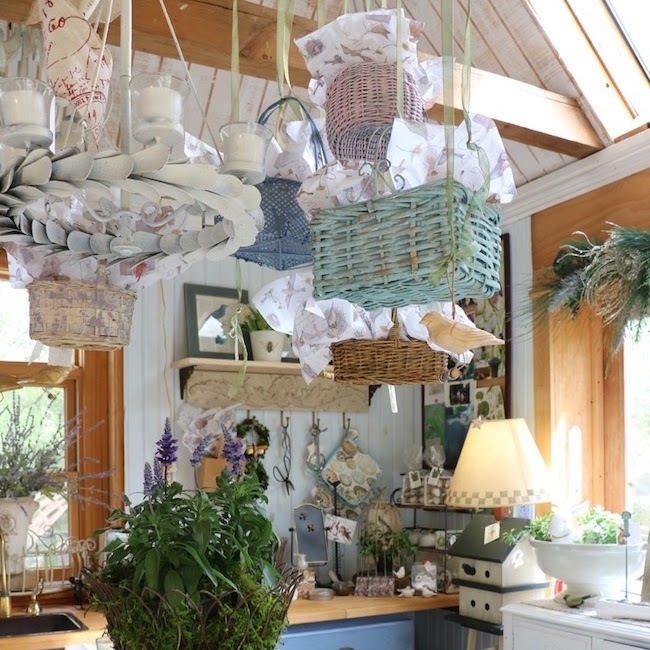 Can you believe it is time to begin decorating for Christmas? 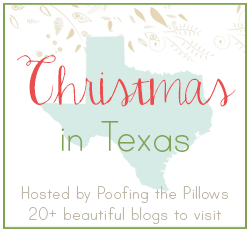 when over 20 Texas bloggers share a window into Christmas in Texas. 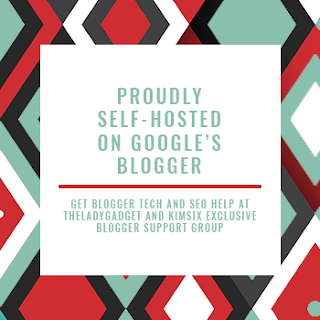 and this is going to be a great Christmas blog hop! that include decorations, crafts, recipes, and even a fashionista. Watch for more details in the days to come. Beautiful table, Judith. Love the feathers idea. Have a very happy Thanksgiving! Your table is gorgeous, Judith! I especially love the touches of nature and beautiful feathers. Every little detail is wonderful. It makes me wish I was hosting Thanksgiving this year, but it our son's new in-law's turn this year. 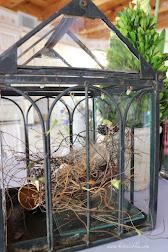 Beautiful and glitzy with touches of nature looks perfect. 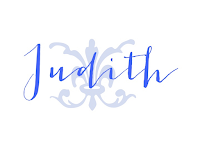 Oh Judith, this is the most beautiful setting i have seen, love all the white and gold, the stamped French script feathers I need some, the golden stem pumpkin of white, the crystals from William Somoa....I love their store and have Shopped all my culinary goods from them. I can not resist a bargain, but have never been to an outlet of theirs, the closest one to us is quite a distance, I must make a trip one weekend to do so. I know your Giving of Thanks with family will only delight in all you are blessed with. I am inspired here, wondering if I could take my rubber French stamps and stamp up some of my white and grey feathers, I will let you know how they turned out. Come visit my new post.... I am honoring France at our table, rustic and rural all things French. White and gold is SO elegant together! What a gorgeous elegant table! 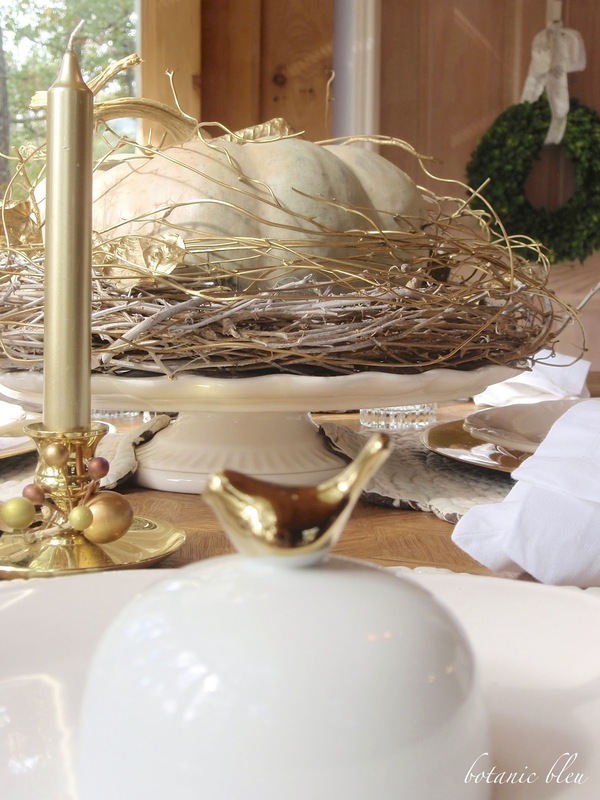 Everything looks so beautiful from the feathers, to the centerpiece, to the birds, to the silverware trimmed in gold, to the candles....well, just everything!! So, so beautiful!! Happy Thanksgiving sweet friend!! I love your Thanksgiving table!! 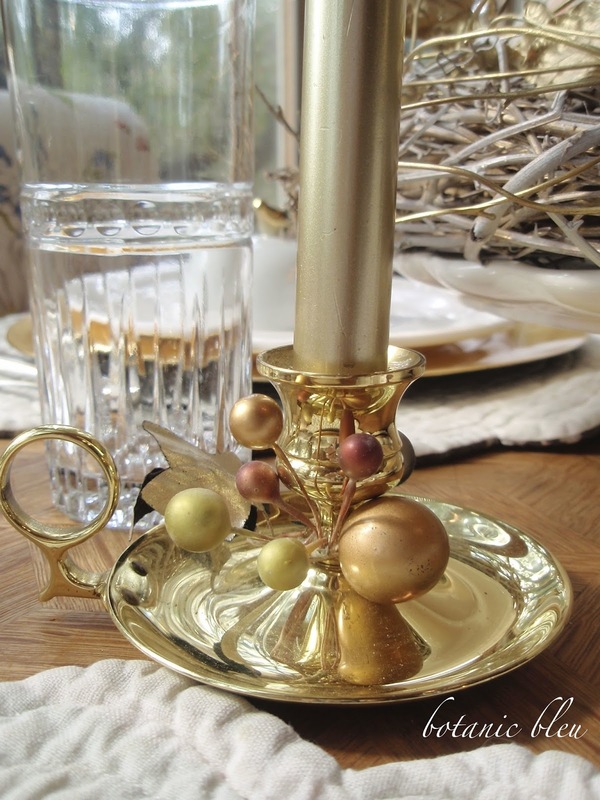 The white and gold go so well together and can work well into the transition into Christmas! Very elegant and the feathers are a great idea. 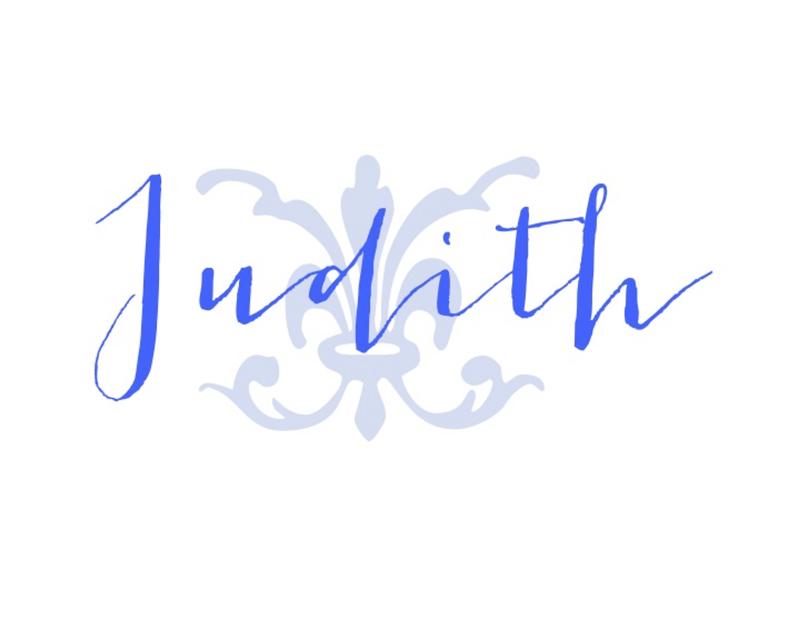 Beautiful Judith! I love the feathers! Thanks for joining Home Sweet Home!